Truly wireless earbuds have been all the range ever since Apple released its AirPods last year. Apple was nowhere close to being the first company to release cord-free earbuds, of course, but it’s definitely responsible for popularizing the category. AirPods are great, but they have two main flaws: they’re expensive, and they’re made out of smooth plastic so they don’t stick securely in your ear canals. 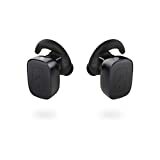 If you want to check out a wildly popular alternative that addresses both of those problems, the SmartOmi Q5 True Wireless Bluetooth Headphones are currently on sale on Amazon at the lowest price ever. Use the coupon code 50ROKMB2 at checkout and you’ll pay just $19.99!